Recently I was invited to attend a training session for the Dementia Friendly movement, which has been gaining momentum in Massachusetts over the past few years. The event took place high up in the Ashburton building, not far from the State House and its gilded dome. And because I have trouble going through security on my own—I always fret about leaving my phone, my keys, or my wallet behind—I was asked to come earlier to avoid the crush when going through security. Only when the session got underway did I realize that I was the featured panelist. My prepared remarks were brief, less than two minutes. When I speak without notes, I often lose my train of thought. But in this case, I was at ease. I asked the audience why I wore a tie today. My answer was if I go too long without wearing one, I might have trouble tying it when I need to wear one. I enjoyed answering the audience’s questions, and was looking forward to having lunch afterward with my former editor at the Massachusetts Municipal Association, the advocacy organization for the state’s cities and towns. Since my meeting ended well before noon, I stopped at King’s Chapel, one of Boston’s oldest public buildings. I paid the recommended donation of three dollars, and I listened to the docent discussing the building’s history. I still had some time to kill, so I decided to stop to use the bathroom at the food court at the center of Downtown Crossing, a place where I’d often had lunch while working at the MMA. Then something queer took place. I wasn’t sure where I was. I knew I had relieved myself at the food court, but I couldn’t remember how I’d exited the building. I knew that the restrooms were on the basement floor, because over the years I had used the facilities on a regular basis. But I was still confused. One possible factor was that the downtown skyline had changed in the years since I’d left my job at the MMA in the summer of 2015. The skyline of 2015 was not quite the same as the skyline of 2018. A construction boom was underway. My internal mental map was due for an upgrade. Before long, I found myself in Chinatown, a neighborhood less than a 10-minute walk from the MMA. I had been walking in the wrong direction. I used to tell friends from out of town that Boston’s Chinatown was quite small. But on this day, the neighborhood struck me as vast and warren-like. And the people I asked who spoke English had no idea where One Winthrop Square was. And why should they? The name might suggest a broad plaza, but it’s really just a postage-stamp square, secluded by taller buildings. All this time my anxiety was building. I could hear my dress shoes slapping on the pavement as I speed-walked, understanding that the worst outcome would be that I would not meet up with my former editor that day. Some readers may be wondering why I didn’t just call or text him. The first answer was the glare; I couldn’t see the screen well enough to find the numbers. I recall a distant period when a cellphone was just a mobile phone. It certainly wasn’t a “smartphone,” a computer that fits in your pocket. The second question was more complicated. I was embarrassed to divulge that I was lost. Plus my stress level was surging. On account of my compromised short-term memory, I would have quickly forgotten most of what my former editor had told me. And I felt ridiculous asking strangers how to find the place where I had worked for almost ten years. At one point, I passed by Temple Place, where the MMA used to be located, when I first started my job. At first, I regarded this as utterly useless information. But then I remembered that in 2006, the MMA had created a video showing the route from the old location at Temple Place, very close to Boston Common, to the new Winthrop Square office. Somehow, that video had become embedded in my long-term memory, and provided some hope that I was finally very close to my destination. I still wasn’t at Winthrop Square. But by this time, I was starting to calm down. A couple of minutes later I realized that I was not too far from South Station. I’d taken a highly circular route, but once I located Summer Street, I knew exactly where I was going and could get to One Winthrop Square. To my relief, I found John, my former editor, waiting for me. I was 35 minutes late. We were both hungry, and I was much relieved. Are there lessons from this? If you have dementia, stay within your limits. Be mindful. Pay attention when you enter a public building. Note which door you entered. And once you come out of a building, make a point to get your bearings immediately. That was probably my main mistake. And keep a mini-notebook and a pen that can fit easily in a purse or a pocket, in case you need to write something down. If you’re inside, make a point of noting to exit from the same passage as you entered. And if you have the good fortune, as I did, to visit Berlin and Prague a couple of years ago, look out for monuments that look similar to other monuments. Arriving at our Prague hotel, my friend and I discovered that “our ancient tower” near our hotel and another “ancient tower” were almost identical. It’s a good way to avoid catastrophe on your European vacation. The real name of Glen Campbell’s 2014 road show was the rather bland “Goodbye Tour.” But nothing was bland about the farewell road show itself. At a point when Glen Campbell was seriously demented, he could still perform songs he had written decades earlier—a musical version of “muscle memory,” the ability to do something without conscious thought because he had done it for so long. When I found the DVD of I’ll Be Me at my library, I thought that I would be viewing a biopic, not a documentary. The entire film is an examination of Campbell’s dementia and his music. And this DVD might have been a first, a celebrity in his last years letting the world into his most private moments, preserved. He was 78 when he was diagnosed, but he also showed stamina—How many performers in their late seventies have the endurance to perform 151 performances at that age? As the Washington Post critic Ann Hornaday commented at the time, “What’s so bracing about this documentary is the filmmaker goes into the dark recesses of his psyche as Alzheimer’s continues to colonize his brain.” And the camera doesn’t just capture the inspiring moments, as when viewers can sense the camaraderie among the many family members when they are on the road. But this is not The Sound of Music. Campbell’s dementia is the unifying theme. One of Campbell’s daughters was fearful that something was going to go very wrong. And why not? By the time the tour commenced, not long after his diagnosis, Campbell was quite demented. He couldn’t always identify his family members. Nor could he tie his shoelaces. And his wife simply commented, “It’s really hard.” At one point, Campbell pronounced, “I’m the chieftain here,” to the discontent of his family members, a sign that he was becoming overbearing. Bill Maclay, the tour manager, suggested that the audience was expecting a stock car race, not a concert, and they were expecting to see a crash. At one point, the teleprompter went off, leaving Campbell untethered from the script of his performance, and calling loudly for the people in the control booth to get it working again. And during rehearsals, his daughter expressed fear that her dad would embarrass himself. But as the documentary advanced, Campbell began showing a surly side, almost certainly attributable to his worsening condition and the stress of the tour. And there was an infantile quality to some of Campbell’s actions, such as when he was shown eating a dish of ice cream, the way a very young child would do it, intent on consuming everything that was still in the cup with his tongue. Country music’s èminence grise died roughly three years after he was diagnosed. I imagine that those last years were not much fun for him or his loved ones. But this documentary is likely to be in circulation for a long time. 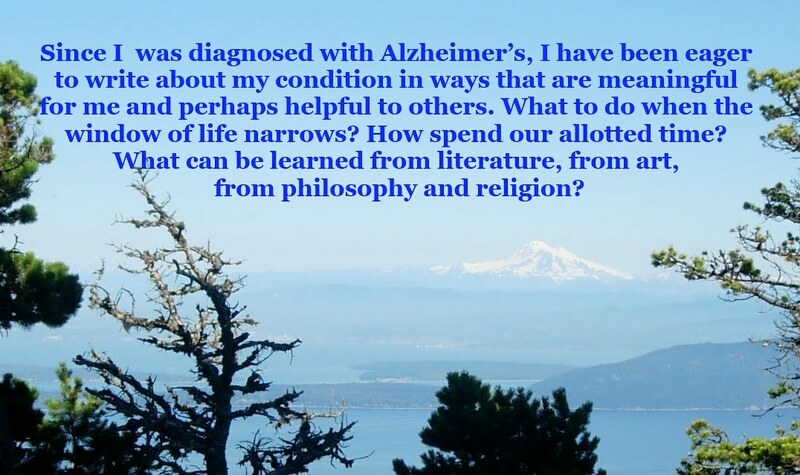 I recommend it to anyone who wishes to understand the later stages of Alzheimer’s, a place no one wants to go.